There was one a wise spiritual master, who was the ruler of a small but prosperous domain, and who was known for his selfless devotion to his people. As his people flourished and grew in number, the bounds of this small domain spread; and it with it the need to trust implicit the emissaries he sent to ensure the safety of it ever more distant parts. It was not just that it was impossible for him personally to order all that needed to be dealt with: as he wisely saw, he needed to keep his distance from, and remain ignorant of, such concerns. And so he nurtured and trained carefully his emissaries, in order that they could be trusted. Eventually, however, his cleverest and most ambitious vizier, the one he most trusted to do his work, began to see himself as the master, and used his position to advance his own wealth and influence. He saw his master’s temperance and forbearance as weakness, not wisdom, and on his mission on the the master’s behalf, adopted his mantle as his own – the emissary became contemptuous of his master. And so it came about that the master was usurped, the people were duped, the domain became a tyranny; and eventually it collapsed in ruins. Making things explicit is the equivalent of focusing on the workings, at the expense of the work, the medium at the expense of the message. Once opaque, the plane of attention is in the wrong place, as it we focused on the mechanics of the play, not on the substance of the play itself; or on the plane of the canvas, not what is seen there. Yes, we cried in Tahrir for “bread, freedom, and social justice”, but the words have since been prey to demagogic abuse and political manipulation. It was the process, the mechanism, the prime cause that gave rise to those words and a myriad of creative expressions in Tahrir we should have protected and preserved. We now seems to be chasing phantoms of that humanizing force. Mere shadows, distortions, and reflections and not the pure light itself. Today marks the 60th anniversary of the 23 July revolution. A purely left brained affair. Young officers planned, schemed, and calculated to maximize their personal self-interest. The young officers lacked little in terms of rational ability. They often fumbled, but their rational motives were always clear. Their drive to dominate was a purely selfish affair, no empathy, no love of other, and no altruism. The current ruling Junta (SCAF) are a byproduct of the earlier revolution. We rose against those mechanical men, who can only conceive of a world were people are spurs and gears in a diabolical machines of their construction. Devoid of creative abilities their machines jammed and broke down and yet they continue to fix them. They are prisoners of their hackneyed mental constructions. …cannot withstand being too closely attended to, since their nature is to be indirect or implicit. Forcing them into explicitness changes their nature completely, so that in such cases what we come to think we know ‘certainly’ is in fact not truly known at all. Too much self-awarness destroys not just spontaneity, but the quality that makes things live; …. religious devotion [can hence] become mechanical, lifeless, and may grind to a half if we are too self-aware. With each passing day, I feel the memory of the early days in Tahrir ebbing away. The sublime beauty of the experience is giving way self-doubt and disbelief. The noise of the immediate is becoming overbearing. A noise that captures the attention of the left brain. Through innumerable logical (yet mostly fake and self-serving) contraptions the limits of what is possible are being drawn. How will our right brained revolution survive as its pathos gradually slips away from mass consciousness? In the absence of truly inspired artists, all that will remain will be some slogans with continually diminishing potency, as smattering of confused ideological posturing, and dreams that can not “be make explicit” lost in the detritus of time. I write this post to try to clarify a few points with regards to the situation in Egypt and process of the democratic transition. This has been spurred by requests form my English speaking friends who are trying to keep up with unfolding events in Egypt and my general dissatisfaction with the reporting of current events in Egypt, such as this WJS article. A referendum where SCAF has proposed constitutional amendments that implied some process of handing over power to civilian control and some vague process for drafting a new constitution once a new parliament has been elected. A brand new council of ministers that is headed by a prime minister who was known to have taken part of part in the revolution. Members of the Coalition of the Youth of the Revolution acting as advisers of the prime minister. Parliamentary elections coming up in couple of month. SCAF is even giving financial aid to you new parties to cover some of expenses of registration and making the legal mandatory newspaper announcements. So why complain? and why take to the street and protest? The logic goes, SCAF is not perfect, but they seem to be doing the best they can. The country needs stability more than anything else. The economy is in tatters and investor confidence is low. Protests are disruptive and slow down the wheel of production. The old mechanism of electoral corruption are still in place (by Carlos Latuff). Referendum: there is a great deal of confusion as to what is was really about. We thought we voting for a amendment to the existing constitution, but SCAF trashed the old constitution and gave us a provisional one that gives it unrestricted powers and no accountability whatsoever. SCAF also sees that the passing of the referendum means that they people of Egypt gave it a carte blanche to run the country (that was not in any of the amended articles!). Interestingly enough the Islamist see the referendum as a vote that affirms that the people of Egypt want their future state to be an Islamic one and not secular. Although the Muslim Brotherhood (MB) and the Salafis (Wahabis is more apt description) have very incompatible ideas of what that might mean. The prime minister and the his council have very limited powers and SCAF calls all the shots via the powers that they have granted themselves in the provisional constitution. The prime minster and the council act as shock absorbers for SCAF, taking the blame whenever it is convenient. Such a tactic has all the hallmarks Mubarak era style of governance. We have a very peculiar situation where the prime minster reports of the minster of defense and not vice versa. The youth coalition have been castrated since they held offices in power and have been quickly loosing whatever support they held in the ranks of the protesters due to their neutral or their lukewarm attitudes on several issues that are key to the protesters demands. Their eroding power base and the proliferation of hundreds of coalitions, many of them from the youth of Mubarak’s now banned national democratic party, have made them completely ineffective. The governing laws for the parliamentary election have yet be finalized, and there are doubts about whether the elections will be truly fair. SCAF have objected to international observers and the old corrupt police force is what used to turn a blind eyes to fraud during election has not undergone significant reform. Parties that are hungry for power have been taking a somewhat comprising in there stance vis-a-vie SCAF so as not to fall out of favor before the ultimate ruler. Hence presenting the false dichotomy of the politics in direct opposition to the protests, and favoring the former for the sake of stability will not sell amongst the protesters. What about the “backlash” against the protests? SCAF has tightened its grip on the media. We now have a a minster of information (disinformation) whose sole purpose is mobilize state media to present SCAF message. That message has been one of fear and panic. Fear about the economy and stability, and panic that there are some dark foreign forces that are now meddling in our affairs. SCAF hypnotizing the populace into believing that revolutionaries are traitors (by Carlos Latuff). Recently SCAF has accused the April 6 Youth movement that they are being funded by foreign and nefarious powers. The movement has played key role in keeping the uprising non-violent and is the largest secular block of all the organized movements with the revolution. SCAF seems however to maintain a very good relationship with the Islamist. 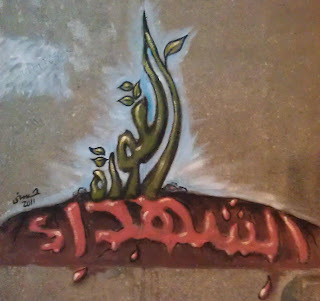 Speculation has been rife in the ranks of Tahrir protesters the Islamist must have cut a sweet deal with SCAF. The accusation has been made without evidence. Recently in an TV interview with a SCAF representative, the talk show host started to ask few hard questions with regards to evidence. The SCAF man was clearly unconformable with her “audacious” grilling. She lost her job as a result. Talk show host Dina Abdel Rahman fired for questioning SCAF (by Carlos Latuff). A few days ago protester were met by a violent “backlash” on their peaceful march to the ministry of defense to press forth their demands. Such a backlash came primarily as the result of SCAF or its agents spreading rumors the the protesters were on their way to burn down the ministry of defense and start up a fight with army. It is telling a few hours prior to the march that Major General Hassan Al-Ruweiny we on TV hurling further accusations at the April 6 movement and condemning the march as the work of saboteurs who care nothing for the greater good of Egypt. He also said there could be many how are innocent amongst the marchers who are victims of “disinformation”. Interestingly he bragged about how used to manipulate the protesters in Tahrir during the first 18 days of the revolution by spreading rumors. 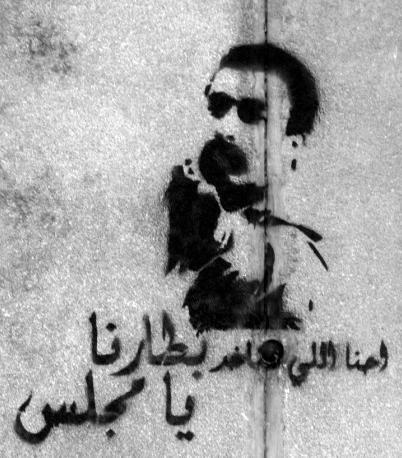 One can only wonder if he was behind the rumors in Abbaseya where the clash happened. Cowardly assault on protesters in Abbaseya (by Carlos Latuff). But what do the protesters want? There are a number of demands and concerns, but the most pressing concern has to do with the families of the martyrs of the revolution and the injured. The families have been subject to threats and pressure from the Police to drop their charges levied against their killers. They have been offered blood money, and if they refuse they were subject unbearable harassment. Similar pressure was also applied to those who were injured during the revolution. The revolution grows forth from the blood of the martyrs (from a mural in Tahrir). The ministry of interior (MOI) in engaged in propaganda to project the view that the deaths were either accidental or (preposterously) the work of foreign snipers. This runs contrary to video footage showing the snipers perched on top on the ministry and during the early days of the revolution. “Snipers!!! Where?” the minster of interior declares (by Carlos Latuff). The families of the martyrs form and core around which protesters gather. They want the killers to be put on trial immediately along those higher-ups who are gave the orders. The demands that the officers who carried out the shooting, the minster of interior at the time, and Mubarak be put on trial immediately. There have been many rescheduled sessions already that most protesters are certain that foul play is involved. SCAF declares that it is not their fault, the wheels of justice just happen to be slow at times and this is the responsibility of the judiciary. We know that the judiciary does not enjoy much independence there is no clear separation of powers yet. 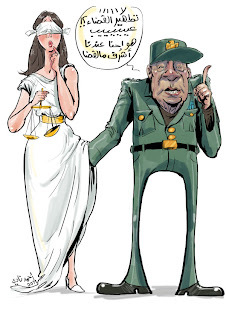 SCAF is molesting Lady Justice (by Ahmed Nady). Those who are protesters will not end their sit-in in Tahrir until they see the wheels of justice turning and they are stratified that it is doing so in the right direction. There is a very serious concern that if SCAF keeps on ignoring such basic demands for justice that things take a violent turn as the ominous graffiti below suggests.